As the first selection for the Adult Summer Weekly Book Club, I was obligated to re-read this novel for the upcoming discussion (my job is so hard sometimes). 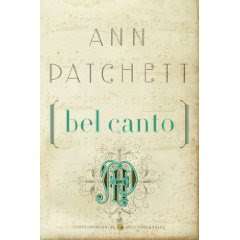 Bel Canto has always been one of my favorite works of literary fiction because of Patchett's beautiful prose and its heartbreaking conclusion. Set in an undisclosed South American country, a group of foreign ambassadors, politicians and one magnificent opera singer are celebrating a guest's birthday when the palace is overrun by terrorists. What starts off as an extremely tense situation slowly grows into a prime example of Stockholm Syndrome where the hostages and the terrorists create their own little shared world together. This novel has everything - there are two sweet love stories, lots of cases of unrequited love, death, violence, suspense, the evolution of unusual friendships and more. In writing this review, I really can't do this work justice. It's that good. Seriously, you should read this novel. You won't regret it. Did you know that you can create short urls with Shortest and make dollars for every click on your short links.